To almost nobody’s surprise, 2017 was ranked as the second-hottest year ever recorded. At 0.9 °C above the 1950-1980 average, 2017 is second only to 2016, when one of the strongest El Niño events on record pushed global temperatures above 1 °C. In fact, when the temperature-boosting effects of El Niño are ignored, 2017 actually ranks first. 2017 continues a decades-long warming trend, with 17 of the 18 warmest years on record now having occurred since the year 2001. Across the globe, scientists finding new and innovative ways of visualizing the warming trend. This week, I thought I would share three of my favourites. This graph was produced by Gareth Jones, a climate change researcher and academic based out of the Met Office Hadley Centre in the UK. For some time, Jones has been comparing observed warming values with the predictions climate models made a few years ago. 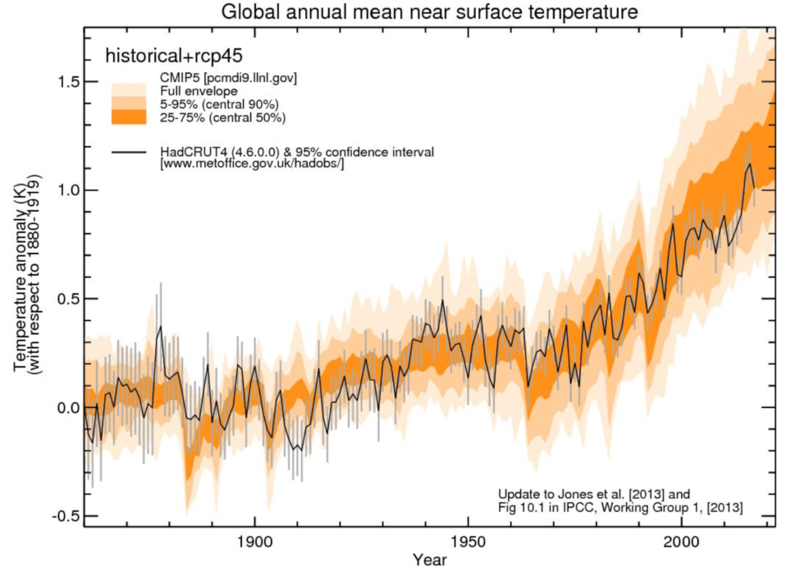 The above graph shows that observed global temperature values (black line) compares very well with climate model projections (orange area). You can follow Gareth Jones on Twitter to learn more. 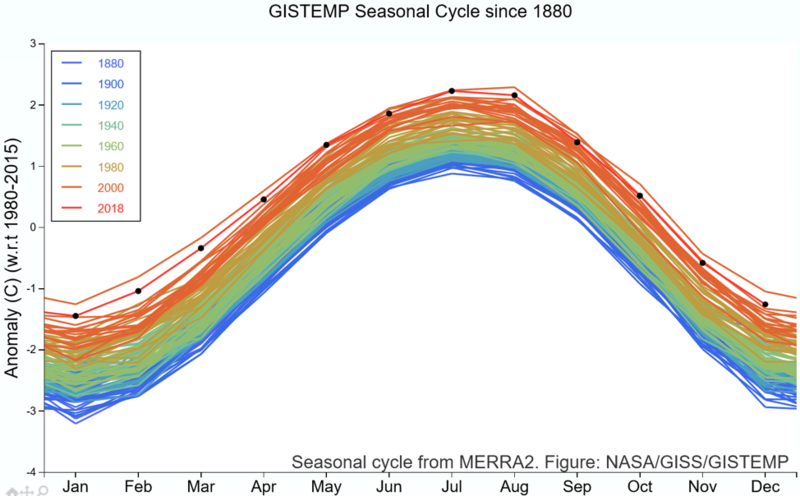 This colourful graph displays monthly temperature anomalies (differences from the long-term average) for every year since 1880, when global temperature record-keeping began. You might expect that the colours reflect temperature values for a given year; however, the colours actually denote decades. The fact that a rainbow pattern emerges is entirely an artifact of the global warming trend: the most recent years are also the warmest. I check this graph monthly, always concerned about how the previous month’s temperature ranked. By May or June of 2017, it was very clear that 2017 was in the running to be the second or third warmest year on record. This animated map drives home the “global” part of the global warming. In any given year, some parts of the globe might be hot or cold (think of how cold this past month has been in Canada and the United States, whereas temperatures were above average for most of the rest of the world). The long-term global warming trend, however, marches on. Next: Next post: Will Climate History Repeat Itself? Lessons from another global warming event.